Handbags play a very important role in women’s daily life, without it , women will get trouble in how to place various make-ups, mobile phone, wallet and other necessities when going out. Apart from being a must-have, a handbag also reflects a woman’s personality in its own way. As a regular visitor of some China wholesale websites like AliExpress and Lightinthebox, I find some really fashionable yet affordable styles of handbags. From the reviews, I learnt that these handbags have been winning love from many women or resellers. Only one handbag is clearly far from enough for a woman—almost every woman has various bags for different occasions. That’s why handbags sell well all around the year in every corner of the world. Now I will talk about the following three styles which are believed to be the most popular leaders of handbags in 2010. Sometimes, handbag designers are also architects，who can decorate the handbags creatively with the three-dimensional geometric patterns, subtly attaching a three-dimensional touch to small handbags. This is obviously a big diversion from the traditional handbags. Embellished by the three-dimensional flowers, a small party handbag looks particularly good on ladies in some important social setting. Also, for appointments, parties or special events, leather evening handbags seem to be a favorite among all fashion accessories for most ladies. The most popular leather handbags imitate the animal skins like crocodile skin, snake skin, leopard skin, etc. This style features the sense of luxury without compromising human beings’ passion towards nature. Following the increasing trends of retro and ethnic styles in recent years, handbags with beaded pieces become more and more popular with their charming and elegant looks. For ethnic-style, different sizes, shapes and patterns made with sequin or embroidery show their complex and superior craftsmanship, which makes this style unbelievably hot in 2010. Likewise, Indian-style handbags are also widely sought-after this year. Filled with a unique temperament, handbags in this style go well with casual dresses. 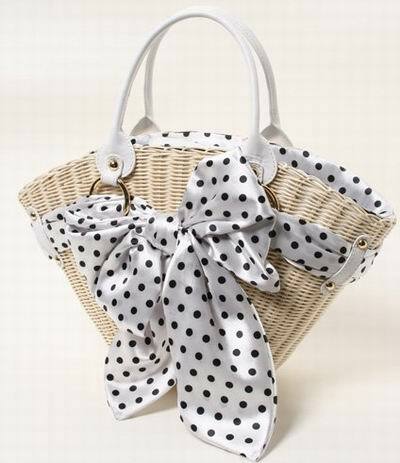 Another new trend of handbags for 2010 must be the pastoral knitting style or rattan style. Along with the environmental consciousness deeply rooted in many people’s mind, naturally, colored woven bags made with environmentally-friendly materials become more prevailing than ever before. This style of handbags stands out by a variety of weaving techniques as well as the wide range of shapes. Some major features of this style are: bamboo weaving or rattan weaving, light weight, large capacity, casual feeling, etc. For spring and summer travel or dating, carrying such a handbag will bring you’re the smell of flowers that are growing in the garden, although in fact you are right in the modern city. Moreover, this style makes young girls look more refreshing and pretty. Newest High Heels on DHgate: What’s So Special? How is the competiveness of TS clothing pricing?